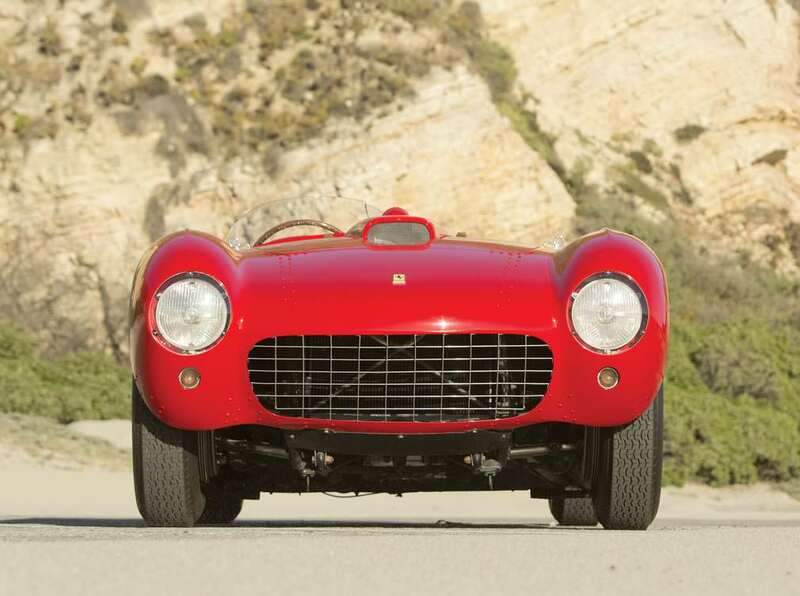 The 1954 Ferrari 500 Mondial Spider Series I by Pinin Farina is a sharp looking racing car with nice lines and dominated the 2.0 Liter field in its prime. 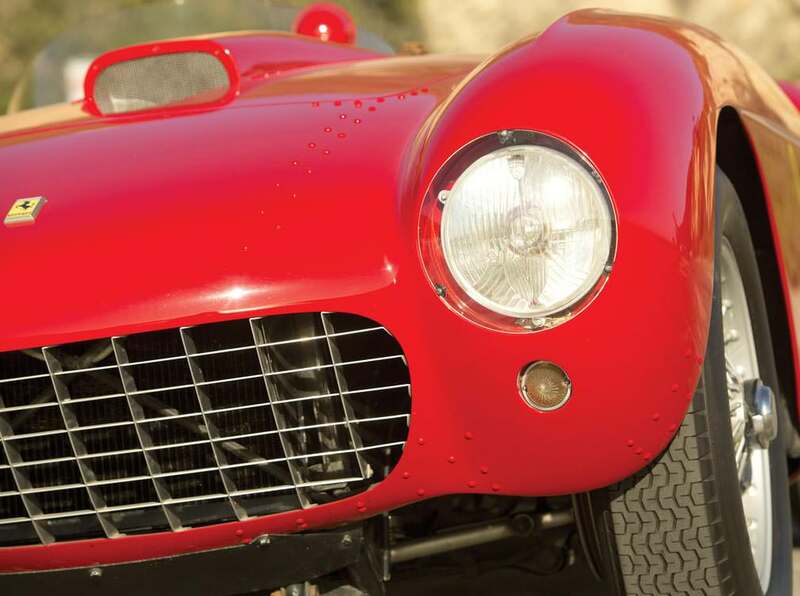 The intent of the Ferrari 500 Mondial was not to come away with overall victories, but to establish a strong presence in the racing industry. 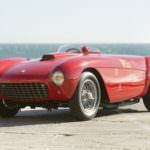 As a result o it racing heritage the Ferrari 500 Mondial is a prized car for any collection. 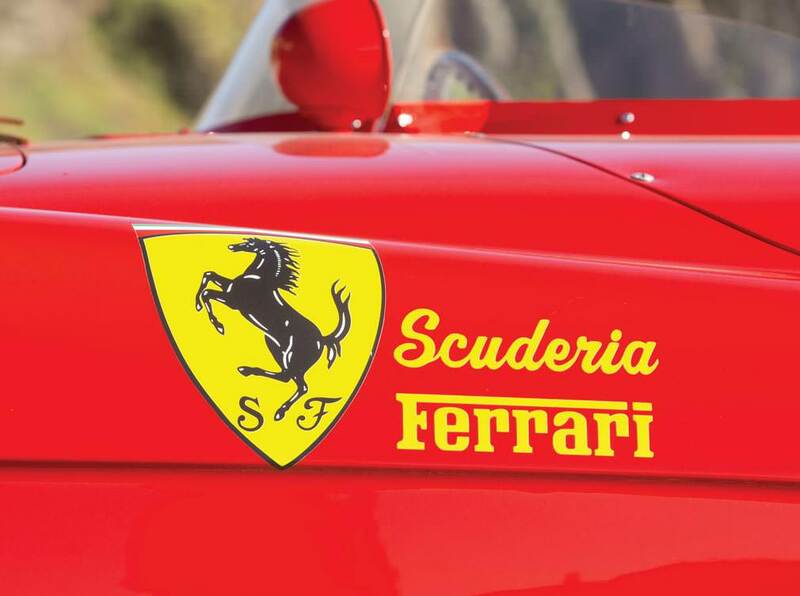 Many in the automotive and racing industry were taken aback when Ferrari moved away from the 12 Cylinder engine in favor of a four banger. Engineer Aurelio Lampredi was convinced that he could get better performance on winding circuits by making these modifications with the engine. 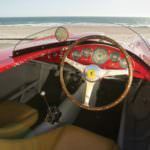 His thought paid off tenfold for driver Alberto Ascari and owner Enzo Ferrari.What made this beauty special was the incorporation of a rear mounted four speed manual transmission, aluminum alloy block, and a gear-driven DOHC valvetrain. 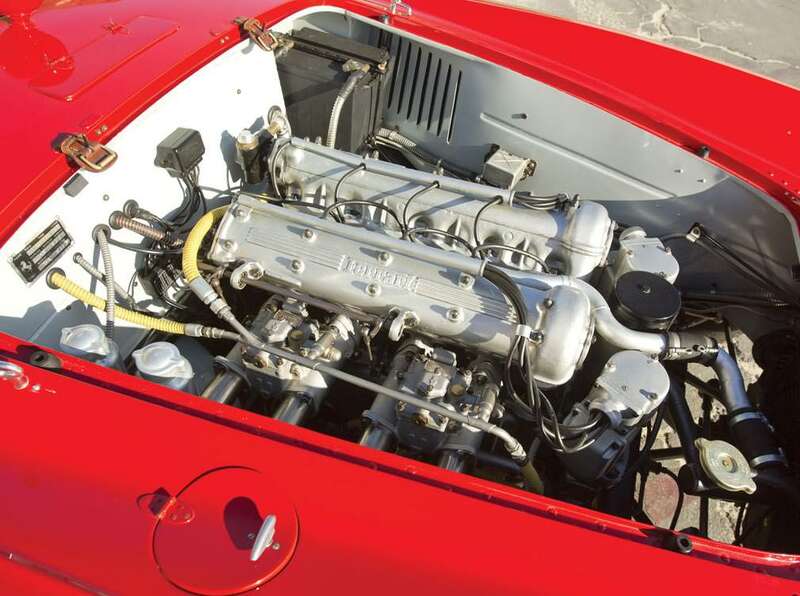 To maximize performance the Type 110 Inline-4 engine was utilized along with two Weber 40 DCOA/3 carburetors. 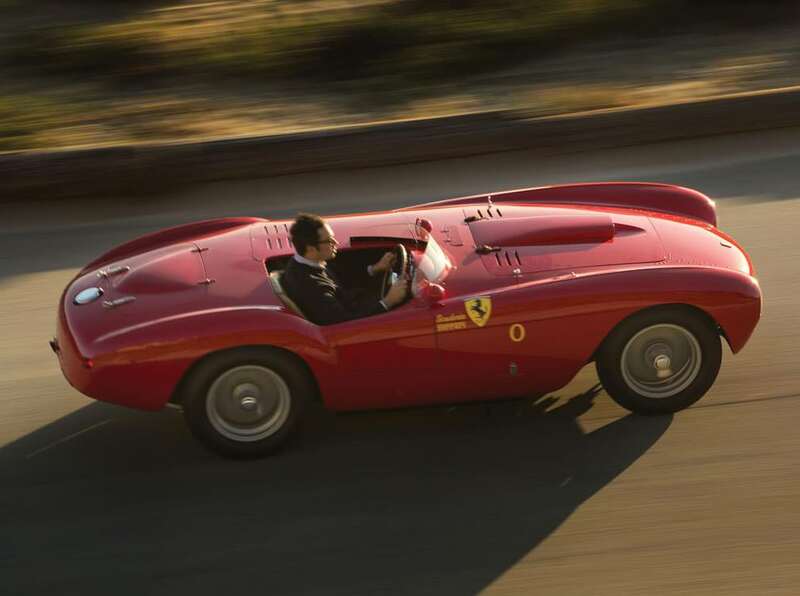 To help lighten the weight on the track, aluminum panels were placed over a steel tube.The Mondial sported double wishbone suspension in the front and De Dion type in the rear. 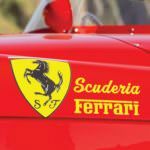 Both suspension systems included a Transverse Leaf Spring and Houdaille Shocks. 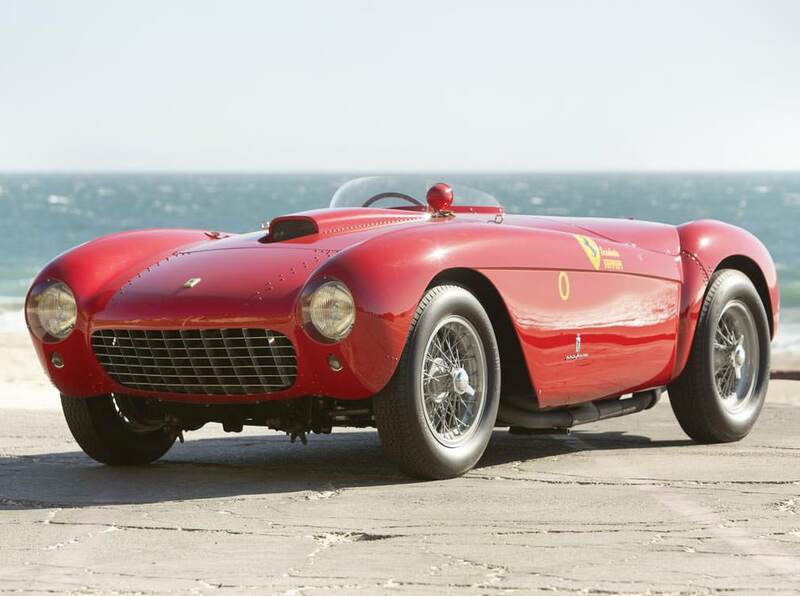 It provided a smooth and sleek ride over terrain presented and placed first in 6 out of 8 racing events under the hand of Ascari.This beauty managed to turn out 155 mph, and was certainly a contender in its class. 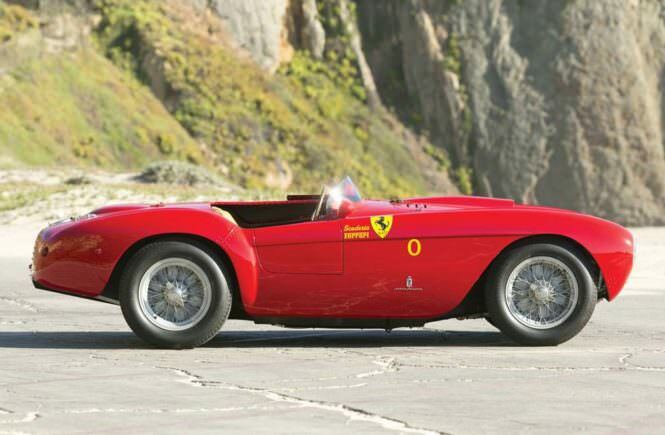 The series however was short lived and replaced by the now infamous Testa Rossa by 1956. 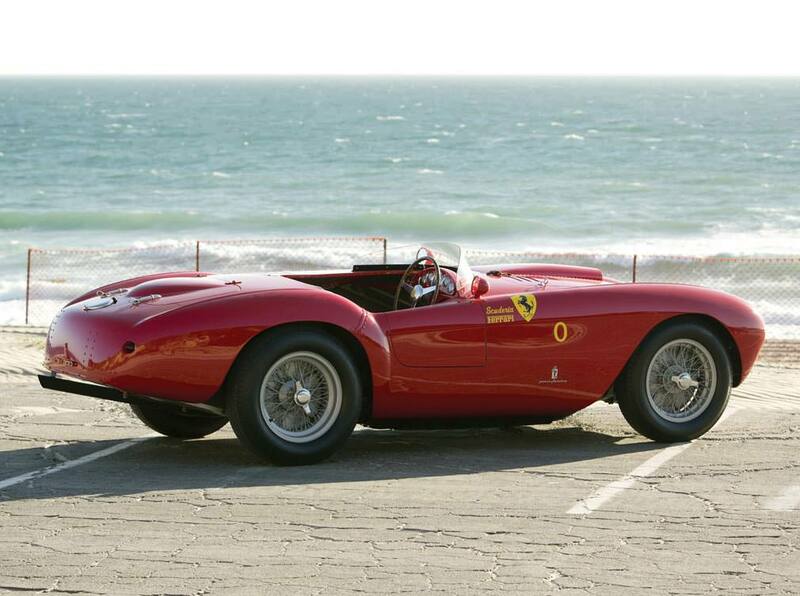 Such is the way it goes in the automobile industry for racing and street car alike.The classics never lose in their appeal. 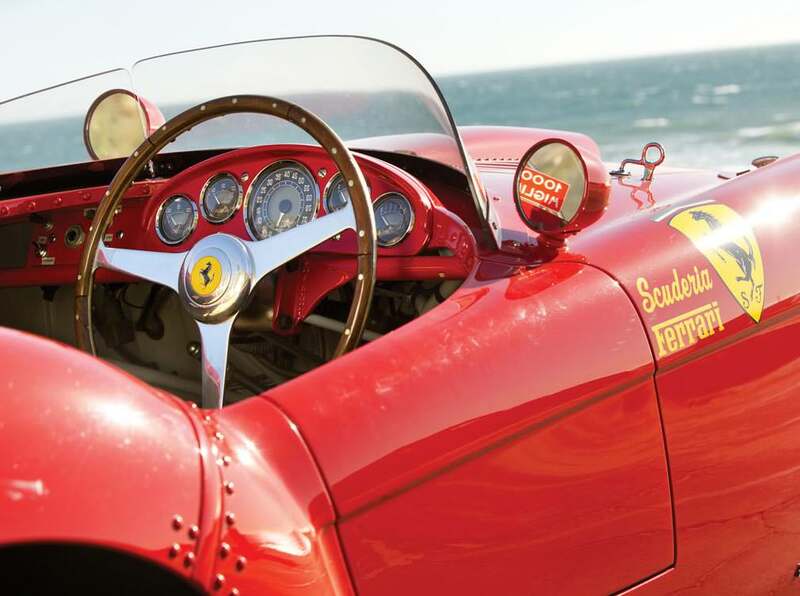 The 1954 Ferrari 500 Mondial Spider embodied the look and performance of excellence that people have come to expect with the Ferrari name. 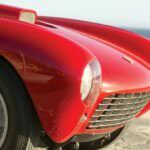 From the excellent coachwork from Pinn Farina and Scaglietti to the engineering prowess of Aurelio Lampredi delivered as promised. 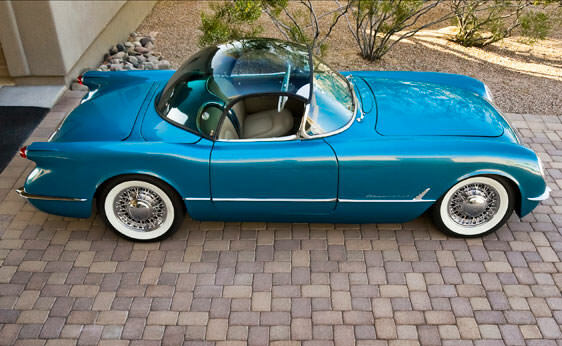 The 1954 Packard Mitchell Panther Supercharged Concept Car is a piece of exquisite machinery. The refined elegance portrays the look of style and grace. 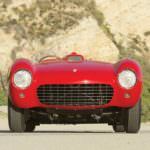 Any auto enthusiast would be pleased to have this rare beauty as a part of their collection. In all there are only four Panthers that were built. 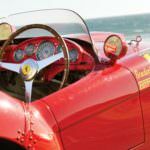 The first two productions were built as show cars. 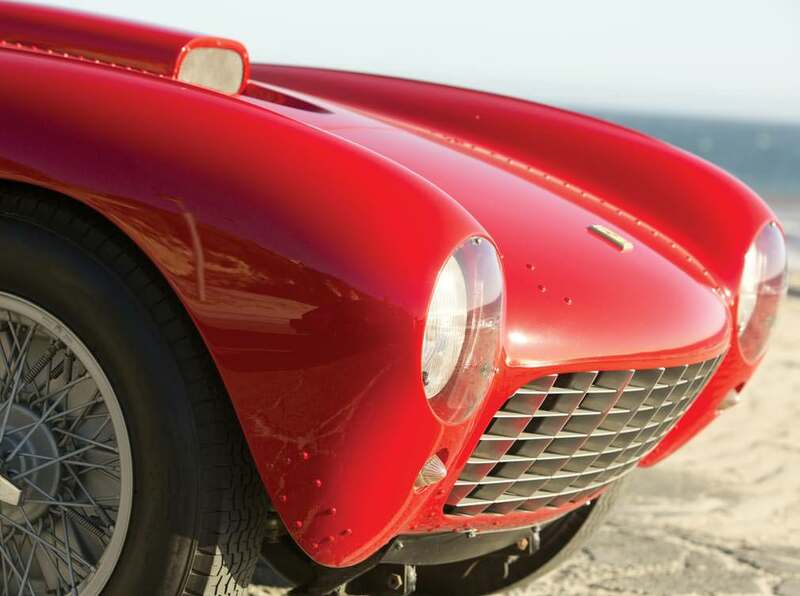 The next two were designed with one as a hard top, and the other a convertible. 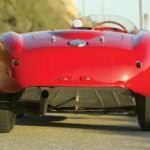 The Panther was an all fiberglass body that featured a 122″ wheel base. The Packard Ultramatic transmission. The Ultramatic was a marvelous piece of machinery perfected by Packard engineers that became overshadowed by competing Hydra-matic self-shifting transmission by Cadillac. 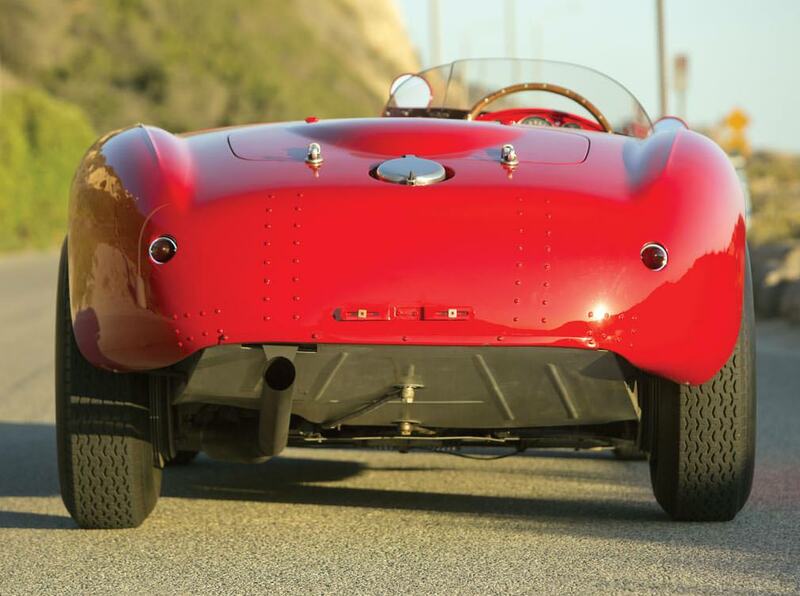 Performance was no stranger to the Panther, even though just a concept car to reinvigorate auto buyers to go with the Packard line. 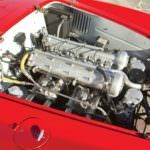 All four cars were fitted with a straight eight 359ci engine. With a power output of 212 HP and 275 HP with the supercharger added in 2 of the vehicles, performance was never a question. 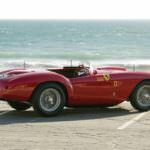 Forced draft carburator with the McCulloch superchargers afforded the Panther the kick it needed to put it in the class of the Roadster. 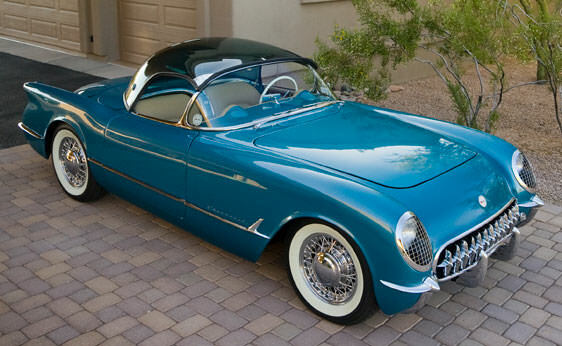 The 1954 Packard Mitchell Panther Supercharged Concept Cars were introduced at a time when sports cars and roadsters were feverishly sought out by everyone who was anyone. 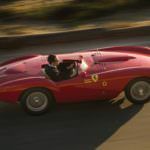 It came at a wonderful time, but could not withstand the fierce competition of competitors like Corvette, the Darrin, Thunderbird, or Nash-Healey. The panther was a stylish sport convertible that took personal luxory seriously to try and be competitive in a hard market. 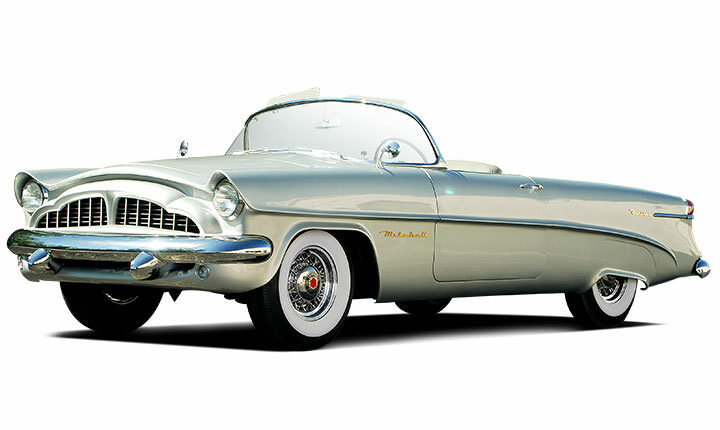 The design of the beauty was similar to other models previously produced by Packard. The taillights were the same as those found on the Clipper, but were replaced later with a cathedral style lighting. 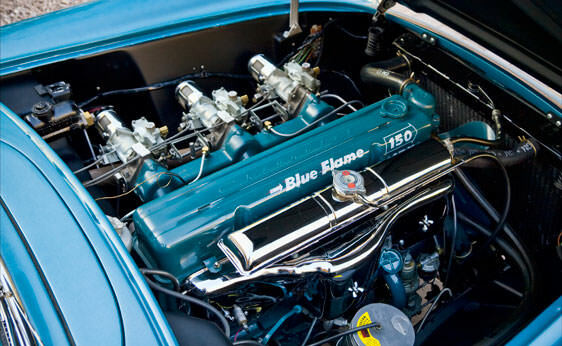 One thing that may have helped lead to the demise of the Panther is that it was being displayed at the same time that Packard was introducing a V8 OHC. 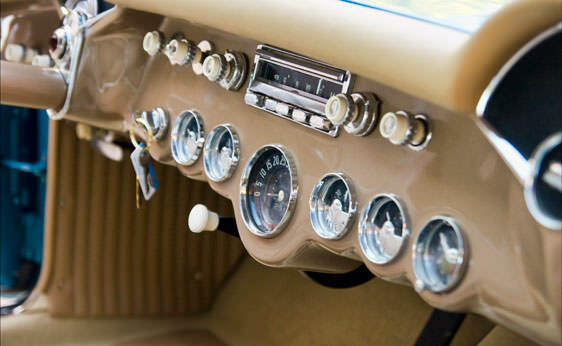 This strategic mistake and the popularity of other cars of the time have all led to the 1954 Packard Mitchell Bentley Panther becoming quite the collectors item. Of the four originally crafted, only two are said to still be in existence. 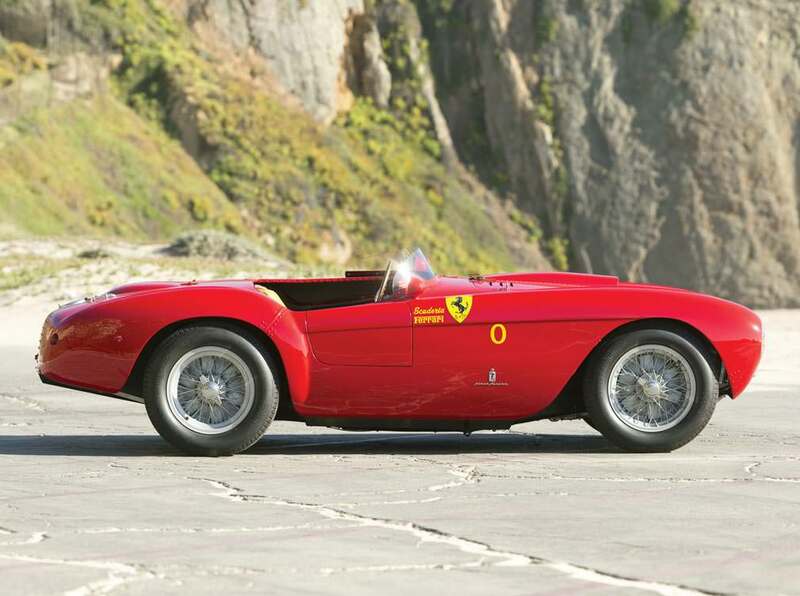 Recently at auction a fetching price of $700,000 was sought and met. Not to bad for a car that never progressed past the concept stage. 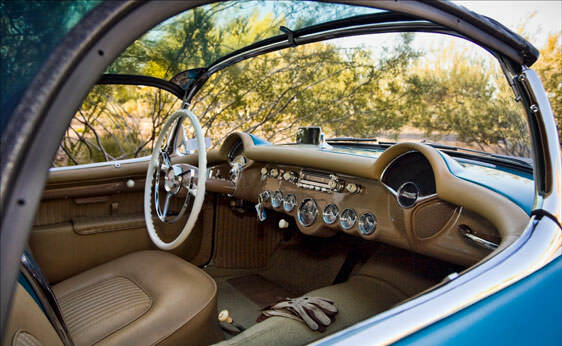 The 1954 Corvette changed little from the 1953 model. 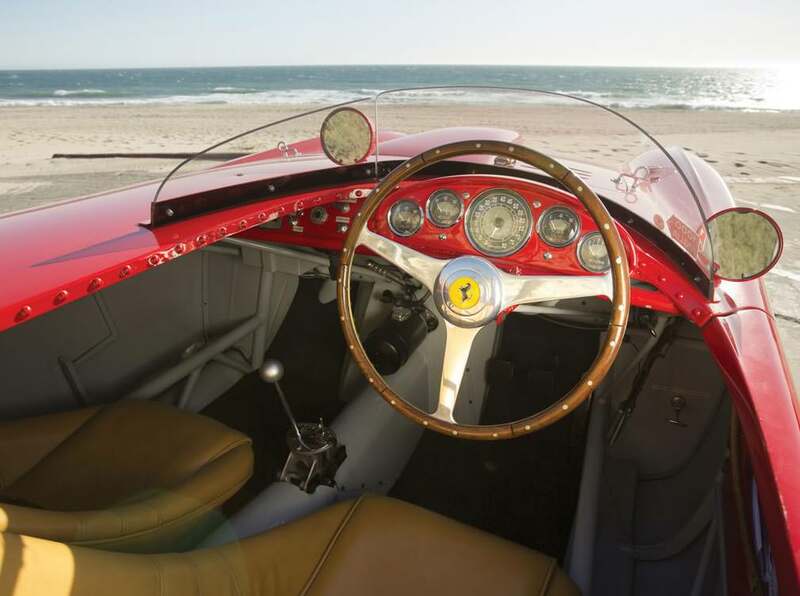 Some fine tuning was done, including adjusting the exhaust system to prevent exhaust from being drafted into the car and spoiling the paint job, redoing the side curtains and their trunk storage bag and coloring them to match the interior, modestly boosting horsepower of the 235.5 cubic inch straight six cylinder engine, improving the dashboard layout and the convertible top retraction mechanics, and finally offering more color choices, including the popular Pennant Blue, Sportsman Red and the previous year’s Polo White. 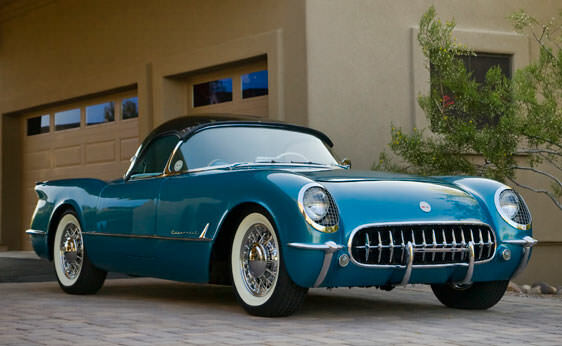 1954 saw Corvette production move to a St. Louis plant for an assembly run of 3,640 cars. 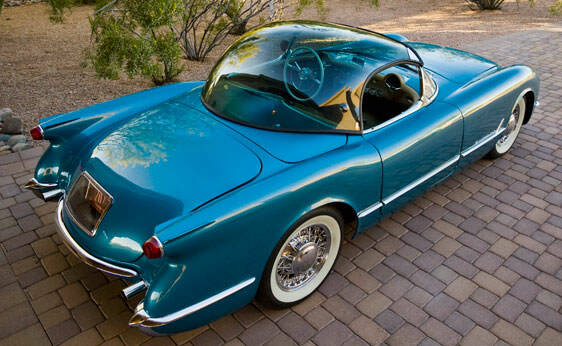 The automotive industry’s postwar fascination with modern aeronautics stylings, evident in the front grill work and tail fins on automobiles since the late 1940s, would make an impact on the 1954 Corvette in a curious way. 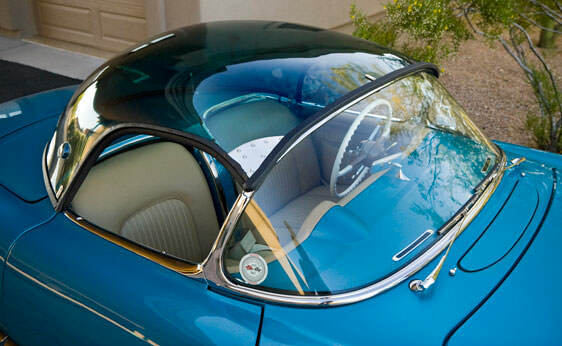 The Corvette design team, after a visit to an Air Force Base, would order approximately 20 aeronautic styled canopy tops to be fitted on 1954 Corvettes. Designed to mimic the domed pilot’s canopy on a fighter jet, these bubbletops were crafted from the relatively new acrylic plastic material now known as Plexiglas. 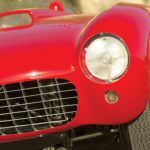 The canopies, while the stunningly styled defining element on the rarest of collectible cars, they were not the best engineering feature to come from the General Motors Corvette team. Drafty, noisy and leaky, the bubbletops magnified sunlight to make the Corvette cockpit unbearably warm. 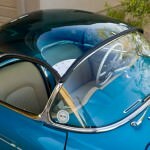 Even so, sold originally to very special customers and top dealers, the few surviving Bubbletop 1954 Corvettes are among the most prized collectible cars of all time.